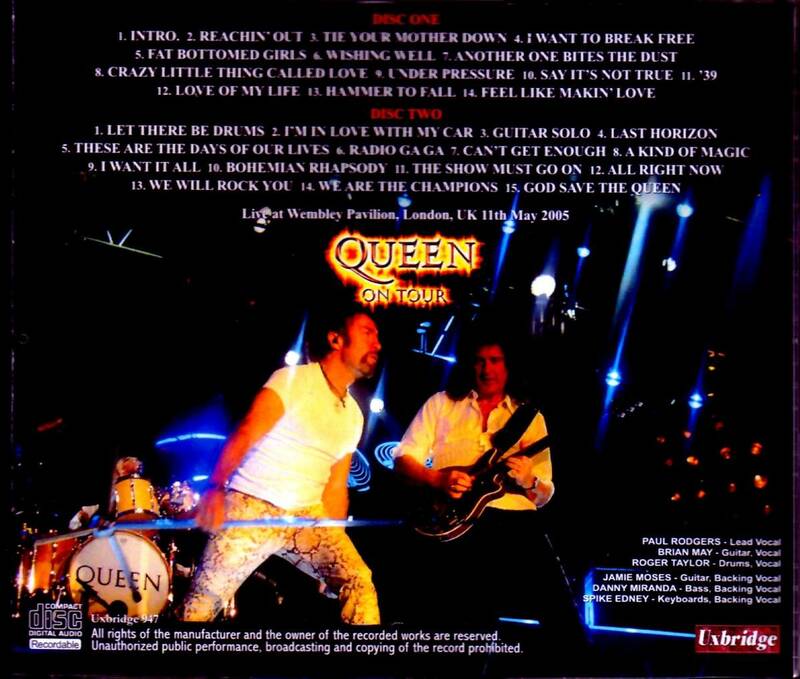 Recorded: Live at Wembley Pavilion, London, UK 11th May 2005. Comments: This concert was first released on pro-2cdr bootleg 'Let There Be Drums', by Japanese TRAIL label in 2005. I'm not sure which source Uxbridge people has use, but they claimed to be from master recording. From the collaboration Brian & Roger did with Paul Rodgers in 2005 - 2008. Paul Rodgers is a name he says as the highest peak even in English hero rookie British rock. A masterpiece original recording that can experience the project of a miracle that brought him up and revived the masterpiece of QUEEN appears. The name recorded in that name is "London performance on May 11, 2005". This week, this work will be simultaneously released as "BRIXTON ACADEMY 2005 (Uxbridge 946)" and "HYDE PARK 2005 (Uxbridge 948)", but these are three sisters' work. The venue is different, they are all homes of London homes and it is a superb collection by the same recording person. However, the content is different even though it is the same London. "BRIXTON ACADEMY 2005" is scattered in March, this work is in May, and "HYDE PARK 2005" is scattered in July. In addition, their early British performances are also official work "RETURN OF THE CHAMPIONS". First of all, let's check the position relation with the tour schedule. · March 28: London # 1 "BRIXTON ACADEMY 2005"
· May 9: Sheffield ← Official "RETURN OF THE CHAMPIONS"
· July 15th: London # 3 "HYDE PARK 2005"
This is the summary of their first European tour. In the commentary on "BRIXTON ACADEMY 2005", we introduced the whole activity, but above mentioned only "Europe # 1" and "Europe # 2" were extracted and described only in the British performance in detail. The London performance is held at the required place, and this work is a live album of "London # 2". It was the next concert following the Sheffield performance which became "RETURN OF THE CHAMPIONS". Such a work is the most brilliant and gorgeous name recording among trilogy. The core that jumps straight in hand is stubborn but glossy, clear to details. It is more amazing than the air feeling shining like sparkling. Transparent to crystal clear, the line of the base also responds and it is beautiful as it pours down the treble. This also makes QUEEN's masterpieces more brilliant. At the time when there were no official work at the time, even in the London trilogy, "HYDE PARK 2005" like "sound board" became the most popular, but this work is the best in the beauty of the total equalization and poured chorus. You can taste plenty of the unique beauty of a customer record. What is drawn with such a beautiful sound is a combination of steps taken after taking the stage. Rogers has performed 26 performances to here, Rogers totally redefines the Queen's repertoire, and Roger Taylor / Brian May, who had been a long tour, is also recovering his can. "QUEEN without Freddy" was also an adventure, but clearly confidence in having received acclaim in various parts of Europe has lead to confidence. I am officially releasing the former Sheffield performance, but the ensemble where the foundation solidified as closely as possible is truly wonderful. And, the set which was chosen by the tour advanced is also delicious. 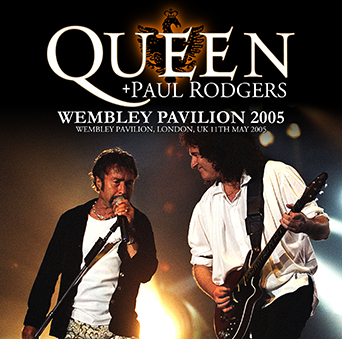 Compared with "BRIXTON ACADEMY 2005" which was the first day of the tour, famous songs such as "Wishing Well" and "Another One Bites The Dust" were added, and "Say It's Not True" later recorded in "THE COSMOS ROCKS", Sandy Nelson "Let There Be Drums" will also be shown. Of course, these were able to be enjoyed even at "RETURN OF THE CHAMPIONS", but there is the existence of "Under Pressure" which Roger sings greatly differently. Although it should not have been said to be extremely rare, some famous songs that were not included in any of the official's three titles "RETURN OF THE CHAMPIONS" "SUPER LIVE IN JAPAN" "LIVE IN UKRAINE". You can taste it with a wonderful sound. QUEEN + Rogers who was growing as a unit so that official official work can be announced. It is a masterpiece that can be soaked in its superb sound at its fulfilling show. Although it is a wonderful live album as one of this work, it is a trilogy in which they can experience their walks in authentic London by combining "BRIXTON ACADEMY 2005" and "HYDE PARK 2005". Please, please enjoy it carefully.